Pregnancy Support is free from wheat, starch, gluten, milk products (lactose), soy, added sugar, colourings, flavourings, preservatives and guaranteed GMO free. Pregnancy Support contains the following key nutrients. Vitamin D - is needed for the normal growth and development of bone in children; Vitamin D3 is the most bio-available form of this nutrient and Pregnancy Support contains vitamin D3 at 30µg per tablet. Maintaining good levels of the mineral iron are important for women during pregnancy and breastfeeding. Iron is essential for the fetus and newborn baby too with iron particularly needed for development of normal cognitive function. The mineral calcium is in great demand during pregnancy. Intestinal absorption of calcium doubles early in pregnancy, and the mineral is stored in the mother’s bones. Later, as the fetus begins to develop, the mother’s stores are drawn upon. Calcium is essential for making the baby's bones and teeth. Magnesium aids in bone growth and is necessary for the proper functioning of muscles. The mineral iodine helps make the thyroid hormones. Suitable iodine levels are important in preconception, pregnancy and breastfeeding as the nutrient supports the baby’s future neural development. 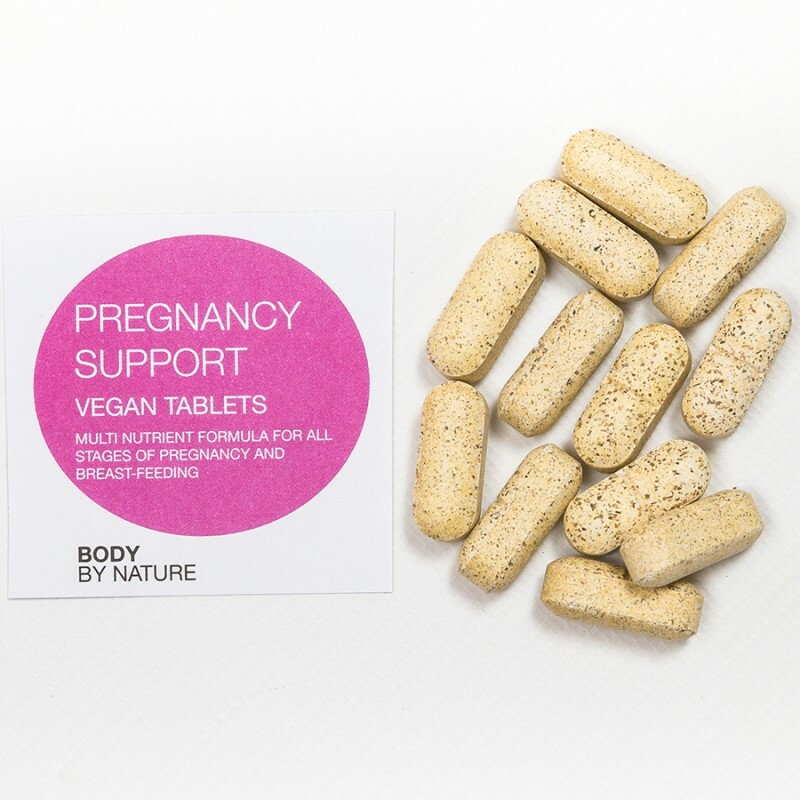 Pregnancy Support contains all eight of the important B-Complex vitamins plus PABA; B6 vitamin Pyridoxine contributes to the regulation of hormonal activity. Vitamin B12 contributes in the process of cell division. Both vitamins B12 and B6 are needed for the production of red blood cells during pregnancy. Selenium is a mineral that plays an important role in our immune system’s function and the protection of cells from oxidative stress The functions of Zinc include growth and human development, the healthy functioning of the immune system, and Zinc Contributes to normal fertility and reproduction. Vitamin C is always important in its protective capacity, the vitamin protects cells and helps keep them healthy. Pregnancy Support contains 3 mg of Beta Carotene (as Vitamin A) per tablet. The Retinol (A1) form of vitamin A should be avoided in pregnancy and this is the recommendation of the NHS. Beta Carotene is considered safer than taking vitamin A because the body only converts the amount it needs at any point in time. Free From: Genetically Modified Substances.